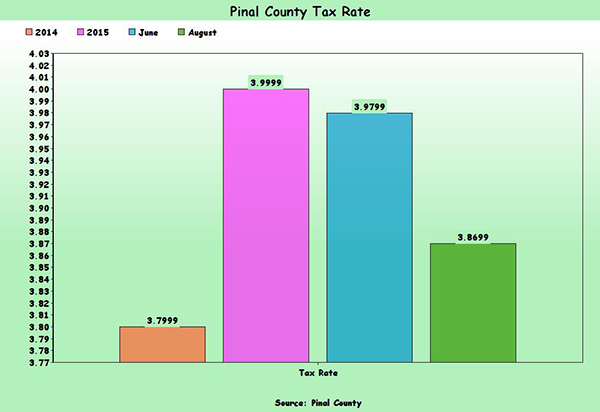 Home Tags Articles tagged with "Pinal County"
A special session on Monday saw the Pinal County Board of Supervisors drop the primary property tax rate by 13 cents per $100 of assessed valuation. In the special session, the Supervisors adopted the rates for taxing districts in the county. Unanimously approving all Pinal County taxing districts rates, the Board then addressed the current property tax rate set at $3.9999. When adopting the Tentative Budget in June, the Supervisors had voted to drop it two cents to $3.9799. At the time of the tentative budget hearing, the Supervisors were still unsure if the State of Arizona would further push to enact the One Percent Tax Cap Liability Shift passed by the legislature in 2015. The One Percent Property Tax Cap Liability Shift was a method of limiting the state’s payment of an “Additional State Aid to Education” tax deduction when a property tax bill of a home goes over one percent of the cash value of that residence. At one time, the state picked up that bill and sent the money to the local school districts. Pinal County was due to pay nearly $1.7 million as ordered to by the Property Tax Oversight Commission. Thanks to a lawsuit brought by Pima County, the state court reversed this cost shift and the state said it would not fight the ruling. There were two options presented to the Board – a 10 cent cut to $3.8999 or a 13 cent cut to $3.8699. The motion was made to cut the tax rate by 13 cents and unanimously adopted. Vice-Chairman Anthony Smith said he understood Supervisor Rios’ concerns. World map from July shows countries of active transmission of the Zika virus. Pinal County has been working for several weeks on Zika surveillance and response plans. Given the recent spread of Zika in Florida, Director of Pinal County Public Health Tom Schryer is sharing surveillance and response information with the community. Unlike West Nile Virus, in the case of Zika, the human is the carrier so once someone is identified as having Zika it is essential that they do all they can to avoid mosquito bites since a mosquito can spread the infection to another human. “If we have a case of Zika in Pinal County, our plans include inspecting the property of the victim and surrounding properties within 150 meters for any signs of mosquito breeding and take aggressive actions to reduce the mosquito population so anyone who has Zika does not spread the virus to a mosquito that can then pass it on to other people,” Schryer said. Additionally, Public Health will survey the health of those residents who live within 150 meters of the impacted residence to determine if there is any community transmission. If there is any evidence of transmission, then the boundary will be expanded based on certain criteria. Pinal County routinely traps for mosquitoes. These traps are brought to the public health lab, where each mosquito is examined and sorted by breed and tested to determine if there is a public health concern. To date Arizona has had 13 travel-related human cases of Zika virus and there has not been any known transmission within the state. Pinal County has no known Zika cases. Public Health is working with local medical providers on surveillance for Zika and other arboviruses. Since pregnant women and their unborn children are the most vulnerable to Zika and have the only known long term health consequences, women should have access to enhanced monitoring while pregnant or planning a pregnancy. There is testing available for Zika when indicated, and it is important that health care providers report suspected cases to their local health departments to facilitate diagnosis and mitigate the risk for local transmission. The most common symptoms of Zika are fever, rash, joint pain, and red eyes. About one in five people infected with Zika will get sick, and symptom onset is usually two to seven days after being bitten by an infected mosquito. For people who get sick, the illness is usually mild and lasts a week. It is important to note that Zika can be transmitted from a pregnant mother to her baby during pregnancy, and can result in a birth defect known as microcephaly. How can you protect yourself from mosquitoes and stop the spread of Zika? There is no vaccine to prevent or medicine to treat Zika virus infection so prevention is essential. You can protect yourself, your family and your community by reducing the sources of mosquito breeding near your home, and avoid getting mosquito bites by using air conditioning, window and door screens on your home, wearing long sleeves and pants, and using insect repellents when outdoors. Women who are planning to become pregnant should avoid travel to areas of the world that are known to have active Zika transmission. Aedes aegypti mosquitos, the mosquito that transmits Zika from human to human live near homes so it is essential that all residents are diligent in their efforts to reduce mosquito breeding. • Get rid of any items outside the home that can collect water to prevent mosquitoes from laying eggs. • Repair leaks to prevent standing water. • Change water in flower vases, birdbaths, planters, troughs, and animal water dishes at least twice a week. • If you have a swimming pool, keep it operational by using chlorine and running the filter frequently. • Repair any damaged screens on both windows and doors. To file a complaint regarding mosquitoes in Pinal County, please call the Environmental Health hotline at 1-866-287-0209 or visit www.pinalcountyaz.gov/ehs. For more information on Zika and pregnancy, please visit www.cdc.gov/zika/pregnancy. I’m not a politician and have no hidden agenda. I’m running for the office of county supervisor because I want to see a change for the better — for the short term and the long term. I believe I can bring positive change. Government is responsible to the taxpayer, not the other way around. I don’t like wasteful spending and I make no apology for it. For the current supervisor to increase his office budget when other departments are forced to cut theirs is an unwarranted waste of taxpayer money. That’s not something I would do. Being active in the local community, election time or not has been important to me. I’ve been a volunteer in our local police department, at the food bank, at our church and at fundraisers and other events for disabled and disadvantaged members of our community. I have almost three decades of international business experience under my belt. I’ve worked well with other people and look forward to continuing to do so. The rift between our sheriff’s office and the board of supervisors needs to be resolved. I’ve spoken with numerous people about it. The capstone of that rift was when the Board of Supervisors terminated the ICE contract. Our county jail was built to house double the population it now has by using bonds that cost the taxpayer about $10 million a year. The ICE contract just about covered those payments. When the contract was lost, the revenue to pay for that bond didn’t come in any longer and had to be taken from other sources — meaning budget cuts to vital public services. We’ve got several more years to pay for it, so it’s not going away. I don’t think it’s right that public safety people were put out of work and personnel can’t be hired because certain people didn’t want to negotiate with ICE. It hurts the public. That was short-sighted. There are people in the sheriff’s office who can work with our federal government to secure that contract, again if given the chance. Doing so would go a long way to solving more than budget issues. We need to bring that revenue source back. I want to see that happen. I’ve made my positions on marijuana and support of public safety pretty clear. I’m against marijuana — any kind — and a big supporter of public safety, but not just law enforcement. There are other basic services that need to be provided by our county. I’ll work hard to do my part and make sure the taxpayer dollar is stretched. The flood zone is a continuous and changing issue. Pinal County is over 5,300 square miles. It’s going to take a lot of cooperation of the various agencies with long term planning to resolve it. Flooding impacts our roads, building of homes and businesses, and where and how people can live. I’ve suggested the various flood control interests come together under one unified agency to evaluate and solve this issue. It’s easier said than done, but it needs to start somewhere. I’m against tax increases — they hurt us all. When our residents are traveling out of the county to work, that means tax revenue goes with them. It also means they have to spend more time in traffic instead of being at home with their families. We need businesses to come and stay in Pinal County. Otherwise, not only do our residents leave the county for work, but tax revenue that could be generated by those businesses goes to other counties. That means the burden of funding government services is placed more and more on our homeowners. We need to take a page or two out of our neighboring counties’ economic development playbooks. If we do it right, we’ll create a greater environment for businesses to come to Pinal County without increasing property taxes. It should be something our children are proud of. I’m looking forward to a brighter future. I hope you are, too. I promise to work hard for you. It’s time for a change. Rich Vitiello is a Maricopa resident and candidate for Pinal County supervisor in District 4. Shirley Ann Hartman has lived in western Pinal County for 56 years, calling the rolling hills and desert washes in the area home. To leave a comment on the four alternatives for the Palo Verde Regional Park, go to this link. The deadline for comments is July 15. So, when Pinal County approved its open space plan that would include some of the land along the western edges of the county as a protected Palo Verde Regional Park, she joined in to do her part. She saw it as a way to preserve the land for future generations. 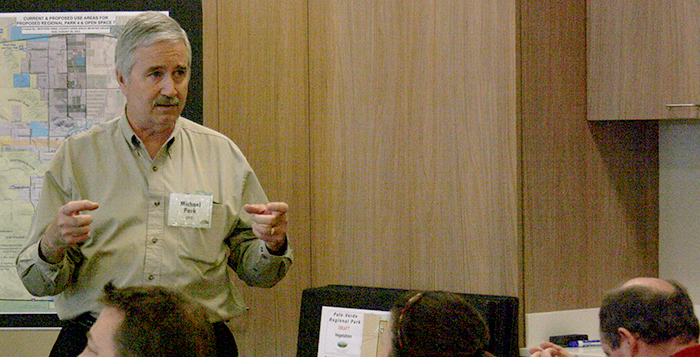 As part of the Pinal Partnership Open Space and Trails Advisory Committee, Hartman worked with other citizens to help design the park. Hartman and other supporters of the park didn’t expect that a vocal opposition would form among some residents in the area. 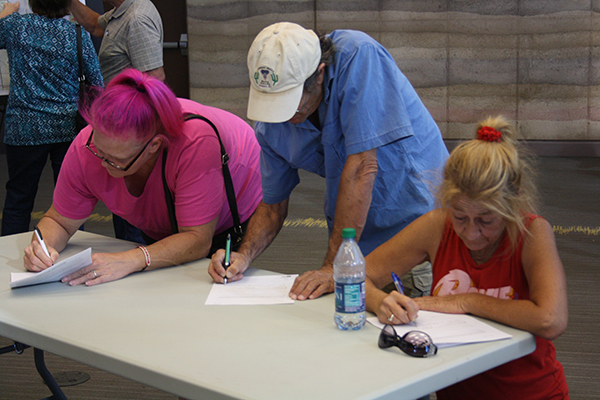 Led by Joe Witinski, a resident of Hidden Valley near where the Palo Verde Regional Park would be, residents have started petitions, packed public meetings and erected signs around the area in opposition to the county’s plan. 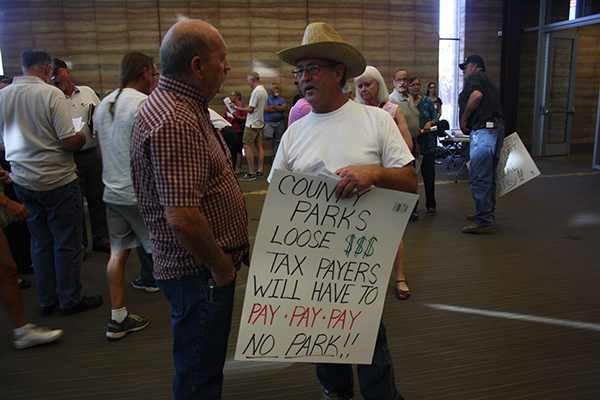 The residents opposing the park see the move as a “land grab” by the county that would burden taxpayers and charge people to go on land they already can use for free. “All they would do is deny … regular users access to land they use all the time,” Witinski said. In 2007, the Pinal County Board of Supervisors approved the Open Space and Trails Master Plan, which would designate areas around the county to be regional parks to be managed by Pinal County. Among those parks is the Palo Verde Regional Park. More than 23,000 acres of land running along the western boundary of Pinal County from Interstate 8 to the south to State Route 238 to the north is designated for the park. That would include the Palo Verde Mountains, the Haley Hills and the Vekol Wash — land that’s currently owned by the federal Bureau of Land Management (BLM). As part of the process for creating the park, public input is being sought on four proposed plans, called alternatives, for how the park could look when it opens. Each alternative has different degrees of infrastructure that could be developed in the park. The deadline for residents to submit comments on the county’s website is July 15. The alternative that’s selected would then need to be approved by the Board of Supervisors. The approved proposal would be included in an application for management of the land to BLM, said Kent Taylor, director of Pinal County Open Space and Trails. Taylor said he expects the plan could go before the Board in the fall. Witinski, who has lived in Hidden Valley since 2001, said when he heard about the plan to turn the land into a county park, he was confused. The land, as it’s managed now, is available for the public to use for free, and turning it into a regional park would only add costs to residents who want to use it and the county that wants to manage it, he said. Witinski launched a Facebook page called Citizens Against Palo Verde Regional Park, which has garnered about 120 likes and posts updates about the progress of the park and perceived deceptions by county officials. He also circulated a petition against the park that he said has accumulated more than 560 signatures. Witinksi said he believes the county’s planning process for the park has also been carried out poorly. Angela Villa, another Hidden Valley resident who opposes the park, said she believed the Palo Verde park would only lead to more costs for the county. “It’s not going to be a money-maker,” she said. Villa suggested Pinal County could take over San Tan Mountain Regional Park, which lies within Pinal County but is managed by Maricopa County, to test out how well they can manage a large regional park. Gina D’Abella, the chair of the Pinal County Open Space and Trails Advisory Commission, said the open space preservation efforts across the county are important to protecting natural resources because there is the possibility the land could be sold to developers as Pinal County’s population continues to grow. “So, instead of people saying, ‘I want no park. I want nothing to happen here,’ it basically equates to ‘we don’t want to protect this for future generations. We don’t want to protect the passive and active recreation opportunities that we’ve been enjoying here for decades,’” she said. D’Abella said the process for planning the park has been ongoing for years and has been open to the public for discussion. She also pointed out one of the four options for designing the park, called Alternative A, would leave the land as it is now. Hartman said residents who gave feedback years ago during the planning for the Open Space and Trails Master Plan for Pinal County all placed open space as a high priority for them. For all the debate swirling around the park recently, it will take another decade or more before the land could actually become the Palo Verde Regional Park, Taylor said. That’s because, it could take another five to 10 years for the proposal submitted to BLM to be approved. If BLM approves the proposal, then Pinal County would look to secure funding for the park. The amount of funding needed depends on which plan is ultimately approved by the county Board of Supervisors. D’Abella said because of this, much of the talk surrounding the park is in the context of current conditions in the county rather than how it will be in the future. The same thing goes for security at the park. “We have to look at what type of illegal activity may be occurring 10 to 20 years from now,” she said. Pinal County Supervisor Anthony Smith, whose district would encompass the planned Palo Verde Regional Park, said he could be open to halting the park process. At a debate in mid-June, the Maricopa Republican said he would support not moving forward with the planning for the park if it became clear that the residents in the area are opposed to it. Smith is up for re-election in the fall. Smith said that based on his experience with annexation as the mayor of Maricopa, he knows that there needs to be a good majority of support in order for a plan like this to work. Even just a slight majority wouldn’t work well for the county. “That never makes for a good relationship,” he said. Smith said he would gauge support for the park from the responses given on the comments for the park. He said he would want at least 60 percent support on the responses in order to continuing supporting the park. His opponent in the Republican primary, Rich Vitiello, said his concerns for the park lie with the costs that the county could bear to manage it and the safety of potential visitors to the park. He said the county can’t afford the number of sheriff’s deputies needed to patrol its jurisdiction now, without the extra burden of patrolling a regional park in the future. Despite the opposition, Hart and fellow supporters are still confident the rural desert west of Maricopa will become the Palo Verde Regional Park, even though that may be decades down the line. “It’s always the loudest people that you hear from when there are a bunch of people out there who don’t realize what’s going on,” she said. The role of county supervisor requires a person to pay attention to details and be a good researcher of the facts. The policies and decisions you make depend on you having a full understanding of the issues. Unfortunately, unlike my previous campaigns, I’ve spent an unprecedented amount of time correcting my opponent’s statements. This editorial is in response to Mr. Vitiello’s latest inaccurate claims. I stated in the recent candidate forum that in lieu of the sheriff spending RICO money for nonprofits, those dollars could be spent for overtime for deputies and investigators. I stand by that claim. In my opponent’s editorial he quotes the Arizona Revised Statues but ignores the “latter” portion of the statute. Quoting in part from ARS 13-2314.03, paragraph E, “OR for any purpose permitted by federal law relating to the disposition of any property that is transferred to a law enforcement agency.” The “OR” statement refers to the document from The U.S. Department of Justice titled “Guide to Equitable Sharing for State and Local Law Enforcement Agencies,” where on page 19 it clearly states, RICO money used for overtime of officers and investigators is a permissible exception. Nonprofit giving is very important, but when people in certain rural areas are afraid to go out at night or don’t feel safe in their neighborhoods, I believe protecting these citizens by paying overtime for additional patrols is the higher priority. Another claim made by my opponent is that solving the historical flooding problem in Maricopa is just talk and no action. As I stated during the forum, a plan to protect the City of Maricopa and the rest of Pinal County is very much in progress. The City of Maricopa and a host of other municipalities, Native American communities and other interested parties are all members in the Lower Santa Cruz River Alliance. The Alliance is an advocacy group that is working directly with the Corps of Engineers on the project. 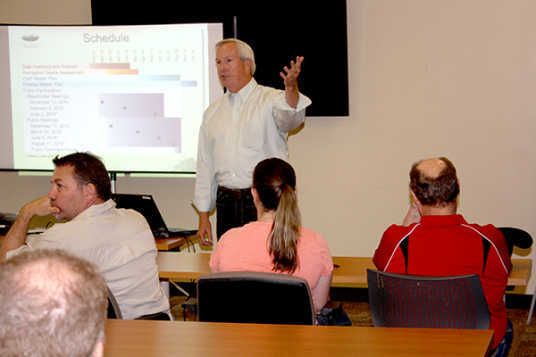 Later this year and as part of the Feasibility Study, the Corp of Engineers plans to introduce some conceptual designs to mitigate the 100-year flood for Maricopa and other parts of Pinal County. By this time in the campaign, I believe a candidate should be able to correctly name the communities in the district in which he is campaigning. In Mr. Vitiello’s last editorial, he says he has been speaking to people throughout the district including Stanfield. Stanfield is not part of District 4. Lastly, Mr. Vitiello’s reference to my supporters as “minions” is both unbecoming and unprofessional. After this election, we most likely will continue living in the same community and this type of behavior is divisive and separates people. 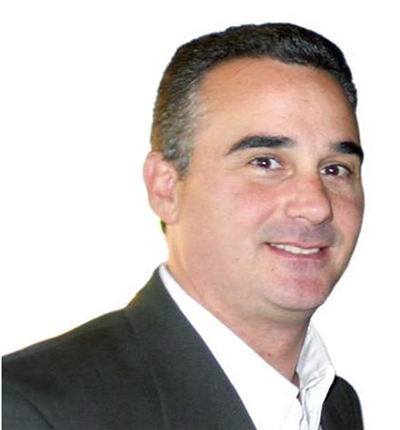 Anthony Smith is a resident of Maricopa and the incumbent county supervisor for District 4. He is running for re-election in the Republican primary against Rich Vitiello. Regarding the upcoming election for Pinal County Supervisor for District 4, we need a change. We need representation. 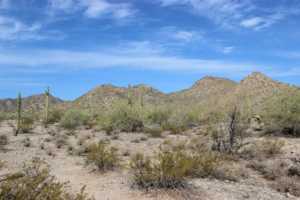 I have been a resident of one of Pinal County’s rural areas, Maricopa/Hidden Valley, since 1997. In that time I and many neighbors have become highly involved in local issues, such as developments, zoning, comprehensive plans, general plans, annexations and much more. I have dealt with a couple of different county officials in the supervisory position, along with dealings with county officials in numerous other counties across Arizona. In all of my experiences, I have never come across a county representative who has neglected and failed to support the people he is supposed to represent more than our current Supervisor Anthony (Tony) Smith. Yes, a little harsh, but true. I have had dealings with Mr. Smith prior to his election as county supervisor and none were beneficial to our communities. There are plenty of documents to prove these issues are true. Once Mr. Smith was elected to county supervisor, we hoped he would fulfill his duty as representative of Pinal County residents, all of them. We quickly found those wishes left unfulfilled. 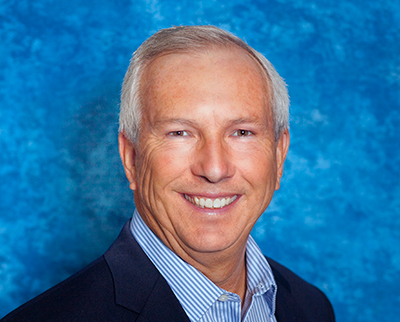 From Smith’s disregard for locals’ opinions affecting them directly under his representation, to Smith openly supporting those who are not residents and voters, but visitors, to his drive to push for directives and issues within the City of Maricopa (which have their own governing boards) more than for the people who he is the sole representative of. Whether it be zoning issues, representation appointed by Mr. Smith, annexations, developments, public notices, zoning changes/requirements, safety issues, lack of notifications, emails from his constituents left for months unanswered by Mr. Smith or simply taking the public’s ( that he is elected to represent) input into consideration, a very large group of us has never experienced a more disappointing lack of cooperation and misrepresentation than we have under our current supervisor. I remember many years ago meeting with Mr. Snider, who was a much better suited representation for our district and highly involved with his local meetings and input with people and communities within his district, which was double the size it is now. We need that representation back. I (and many others) openly support change for Pinal County District 4. We need representation that does exactly that – represents all people of Pinal County, especially those whom the county supervisor is their only source of representation. I have met with Mr. Vitiello, on numerous occasions, attended the debate and more. I like the fact that Mr. Vitiello puts himself out there as a representative of all Pinal County residents. He understands not everyone has the same lifestyles, wishes, desires, dreams and hopes. Mr. Vitiello is not pro-unincorporated, he is not pro-incorporated. What he is, is pro-Pinal County. He is someone who can open-mindedly and in a beneficial manner represent all of Pinal County’s very diverse residents. Mr. Vitiello has already proven himself responsive to people across District 4 (especially the TBird/Hidden Valley area, though we hold little voting value in comparison to other areas). When called upon, he acts. Mr. Vitiello is already highly involved in those same communities across the district, again, regardless of incorporated or not. Mr. Vitiello has not told us something, simply because it is what he believed we wanted to hear, but he agrees to listen and learn, to take all points into consideration. He is motivated and open minded, well versed and well rounded in his life and his community and I believe that he can carry Pinal County District 4 into a very beneficial future for all its residents. Today and on Election Day, Mr. Vitiello will be my choice for Pinal County Supervisor of District 4. We need change. We need and deserve honest and beneficial representation. 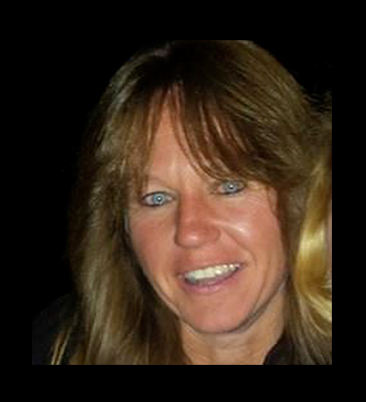 Angela Villa is a resident of the unincorporated Hidden Valley area of Pinal County. 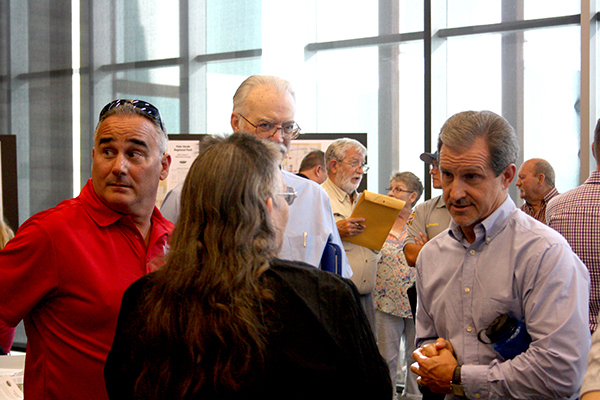 Plans for a proposed county park to the west of Maricopa met strong opposition from some residents and curiosity from others at an open house on Tuesday. 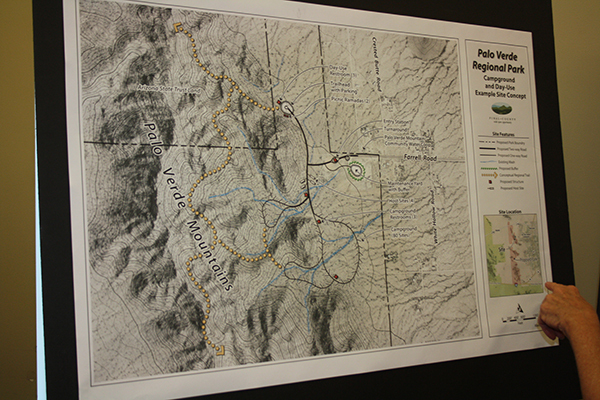 Pinal County Open Space and Trails hosted the public open house for the Palo Verde Regional Park to give residents a chance to vote on and submit comments for four plans for the proposed park. Organizers anticipated about 200 people would attend the meeting, which was held at the Maricopa campus of Central Arizona College. Palo Verde Regional Park would be located west of Maricopa, spanning about 23,000 acres from Interstate 8 to the south to State Route 238 to the north along the western boundary of Pinal County. The park plans to include parts of the Palo Verde Mountains and the Vekol Wash, as well as providing connectivity to planned trails, according to the county’s website for the proposed park. The land for the park is currently controlled by the Bureau of Land Management. 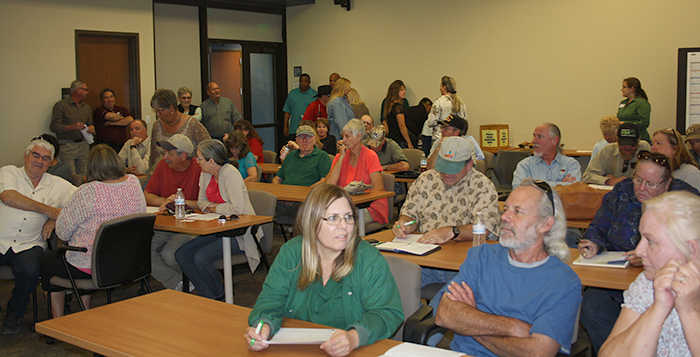 The open house allowed residents to vote on different plans for the park, which vary based on infrastructure, amenities and access, said Gina D’Abella, chair of the Pinal County Open Space and Trails Advisory Committee. “Tonight is so important because Maricopa will have the opportunity to vote on which alternative they would like to see in the future park,” D’Abella said. “It’s a burden to the taxpayers and this is basically a grab to get control of land,” said Joseph Witinski, who has organized opposition to the park. Witinski launched the Facebook page Citizens Against Palo Verde Regional Park, which has accrued more than 100 likes. He said more than 560 people had signed his petition opposing the park. 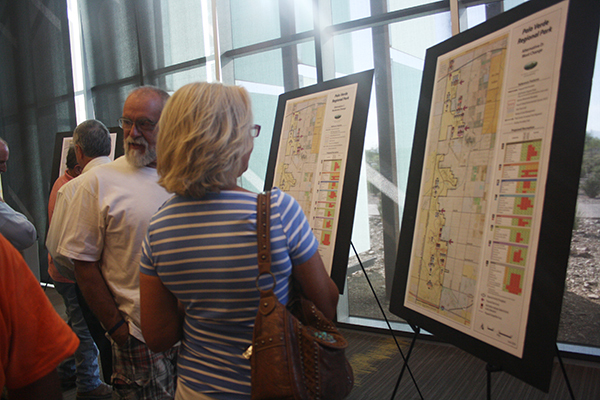 At the open house, maps detailing the alternatives were set out for attendees to view, and officials fielded questions about the proposals. 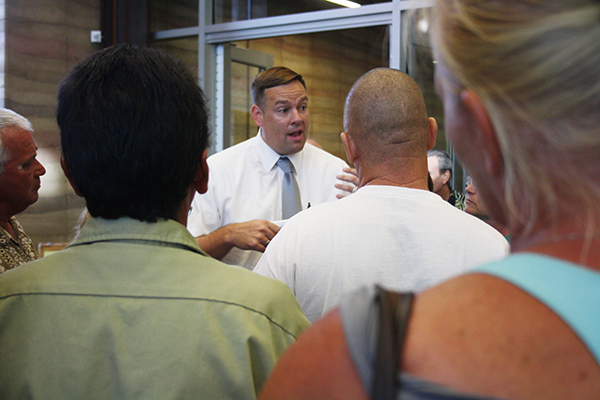 Supporters and opponents of the park argued the merits of the park during the open house, too. The four alternatives offered differ based on the amount of infrastructure the park would have, D’Abella said. These proposals include hiking trails, ATV trails, shooting ranges, campgrounds and space for other types of activities. The amount of infrastructure increases with each of the alternatives. The first alternative, for example, would preserve the land the way it currently is under BLM management without adding anything, D’Abella said. The fourth alternative would have much more park infrastructure added. In 2007, the Pinal County Board of Supervisors approved the Open Space and Trails Master Plan, which would create county parks. The county submitted an application to BLM to acquire the land along the western edges of Pinal County in order to manage a future park there. The selected alternative for the park will go the Board of Supervisors in the next few months for final approval. 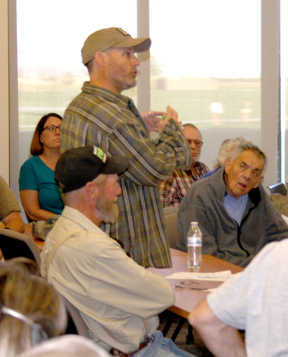 The Tuesday night meeting was the third open house held for the proposed park. The park is still years away from possibly opening. D’Abella said BLM historically has taken about five to 10 years to approve that kind of master plan from counties. If BLM approval is given, then Pinal County would move to secure funding for the park. 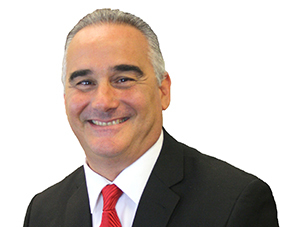 The amount of funding needed would depend on which alternative is selected to be the official plan for Palo Verde Regional Park, D’Abella said. Some opponents of the proposal who live near the land for the park say they can already access that land for recreational activities and the park designation means they would need to pay to use it. “Why do I want to pay for something that I use now for free?” said Jyl Heun, who lives near the site of the proposed park. D’Abella argued that BLM could sell the land to developers, as it had done in the past with other land in Arizona, and this action would preserve the land as open space. Heun, who also volunteers for search and rescue in the area, said building the park would require more resources from the county to patrol the area and perform rescues for hikers who may need help in the park. “Everyone needs to be found, but it’s going to be a huge, huge drain on economic resources,” she said. Other parks are in the works around the county, too. The Pinal County Board of Supervisors in November approved a plan to work with BLM to acquire land near Florence Junction to create the Peralta Regional Park, which would be about 480 acres. Sun Life Family Health Center is taking every precaution to provide for the health and safety of our patients, staff and visitors, and is reminding our communities to follow the most current recommended guidelines from the Pinal County Department of Health regarding the current increase in measles activity. Pinal County now has 13 confirmed cases of measles. * If you have a healthcare provider, contact them by phone and let them know that you may have been exposed to measles. They will let you know when to visit their office so as not to expose others in the waiting area. * If you do not have a health care provider, you may need to be seen at your local hospital emergency room/urgent care center. Please call before going to let them know you may have measles. For more information on measles’ signs and symptoms or where you may find vaccine, please check with your healthcare provider or your county health department. You are immune to measles if you have received two measles, mumps, and rubella [MMR] vaccines or were born before 1957 and have received one MMR vaccine. Health care providers, like Sun Life, are required to report suspect cases of measles to their local health department. Public health continues to investigate contacts and places of exposure for these new cases. The Department will continue to provide updates and additional information on confirmed cases and potential public exposure as information becomes available. For information on signs and symptoms of measles, or where you can find vaccine, please visit StoptheSpreadAZ.com. Medical questions should be directed to your health care provider. For outbreak-related questions, community members may call 602-839-2275. Gaining trust is sometimes not an easy task, especially when going up against a politician who muddles the truth. I don’t split hairs to redefine an action or a term — it is what it is. That’s one of the differences between a politician and public servant. I’m not a politician. When a public servant is seen as transparent and honest in his dealings, people will have confidence to trust that person. With 27 years of international business experience, I’m an experienced businessman who wants to bring his talents forth to help people. To be a public servant. That’s it. I’ve cited things the incumbent has done that I don’t agree with. Many of the people in his district don’t agree with them, either. I truly believe that the people of Maricopa, Saddlebrooke, Stanfield, Arizona City and parts in between should be served by having an honest representative who is genuinely concerned not only about fiscal responsibility, accountability and public safety, but also about the health and welfare of the entire community. Doing the right thing for the good of the people a public servant represents is the most important thing one can do. I switched from the city council to the county supervisor race because it needed to be done. I’m concerned about my family and community. My vision for being a supervisor is to be a servant to the community – to help others. People need real, honest and transparent representation, not lip service. I will work with other people to better the lives of residents in Pinal County. I’ll sit down with residents, business persons, elected officials and county employees to listen, learn and understand their needs. I’ll agree with some opinions, and I’ll disagree with others. I will work hard to get things done with and for other people. But I won’t sell out. People need to trust their elected officials, and that means they need honesty and openness in government — transparency. I believe protecting our citizens and establishing a bond of trust and accountability is key to making Pinal County a better place to live and do business. 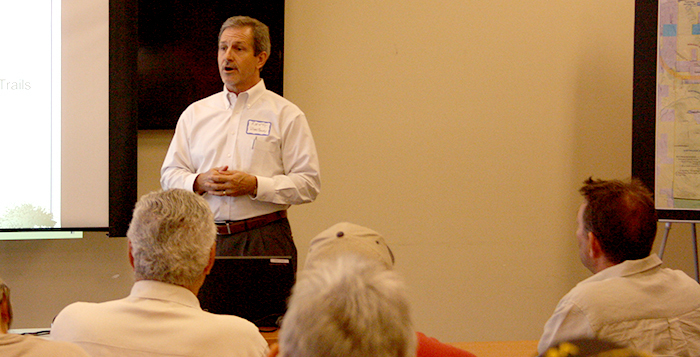 Residents want a county supervisor who they have confidence in. The incumbent says he supports public safety, but his actions speak volumes otherwise. I’m business friendly, but not the kind of business that the incumbent is friendly with. I don’t support business enterprises that degrade our neighborhoods and quality of life. Residents and businesses want security, peace of mind and success. I see that as a priority. I’ll work hard toward those ends. That’s what a public servant does. Rich Vitiello is a resident of Maricopa. He is running against Anthony Smith for a seat on the Pinal County Board of Supervisors. April 1, Pinal County Air Quality began issuing only three-day open burning permits. All permits will expire by May 1 and Pinal County will suspend the issuance of open burning permits on April 28. Additional information on the Pinal County Air Quality program can be found at www.pinalcountyaz.gov or by calling the Pinal County Air Quality Division at 520-866-6929. Facing a vocal and hostile group of residents, proponents of a regional park west of Maricopa tried to spell out the purpose of the plan Thursday night. 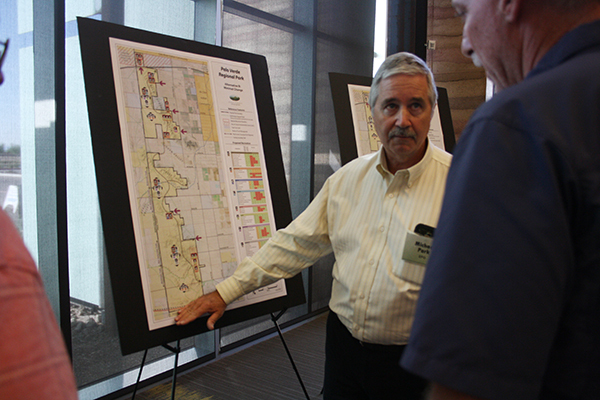 Though there have been meetings and discussions about a possible park since 2007, when the Open Space & Trails Master Plan was approved, and the meeting at Copper Sky Multigenerational Center was the second open house in four months, many in the room said they knew nothing about a Palo Verde Regional Park. They were angry about what they felt was lack of meeting notification in the rural area and they were angry about the park concept itself. Johnson also said bringing more people into the area would increase the danger from drug-smuggling spotters in the mountains. 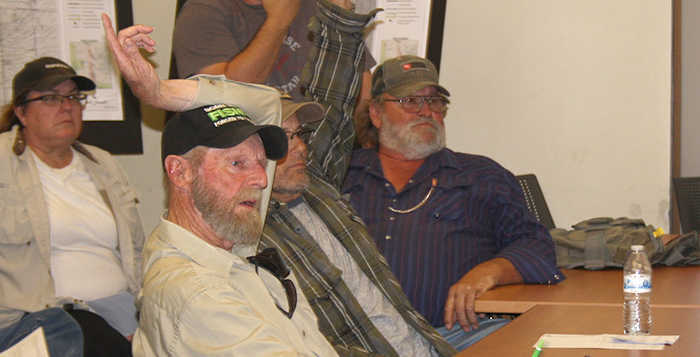 Kent Taylor, director of the Pinal County Open Space & Trail Department, and Michael Park, landscape architect with Environmental Planning Group (EPG), bore the brunt of the push-back from about 15 residents. An equal number stayed silent or spoke up for the park concept. Planning for the park began last fall. Taylor said the open house was a continuation of the information-gathering stage. As residents continued to complain about lack of notification and question the impact on taxes, lifestyle and law enforcement, Taylor repeatedly encouraged them to write their concerns on the comment forms provided at the meeting. A handful of those attending saw the park plan as an improvement in public safety. The most popular items on the list of possibilities for a Palo Verde Park were non-motorized trails, according to an online poll conducted by the OS&T Department. “Trails are fairly easy to build and will probably be in Phase 1,” Park said. The county could also regulate the shooting area that already exists and develop campsites. “The county gets a lot of its funds from camp fees,” he said. Most other activities proposed for the parkland have been spoken of as fee-free. The Open Space & Trails Advisory Commission has hosted field trips into the BLM land to create more discussion on the recreational possibilities of a park. County Supervisor Anthony Smith said creating the park would be funded by development impact fees. Smith spoke to the crowd off the cuff. Though Maricopa city staff was present, they did not wander into the fray. Johnson said it was all just another government money-grab. Taylor said the park proposal would not come to a public vote but would go through intermediate county staff before ultimately coming to a vote of the Board of Supervisors. The next public meeting on the park plans is scheduled for June 9. There will be a preliminary meeting for stakeholders June 2. Pinal County’s unemployment dropped more than 1 percent over the last year. Data released Thursday by the Arizona Department of Administration show January’s jobless rate was 5.6 percent. That number a year ago was 7 percent. Unemployment was 5.7 percent in December. In 2015, the lowest jobless rate recorded for the county was in May, and also 5.6 percent. Back then, the labor force was 155,526. In January, there were 160,052 people in the county’s labor force. Tim Kanavel, manager of Economic Development for Pinal County, said employers are moving to Pinal County, including a new casino in Dudleyville. His department is targeting job sectors that include aerospace and defense, manufacturing, transportation and logistics, natural resources and health services. “It’s important we have the workforce for the types of businesses we’re bringing in,” he told the Maricopa Chamber of Commerce at its monthly breakfast Thursday. During 2015, the city of Maricopa’s unemployment fell from 6.0 in January to 5.3 percent in December. Casa Grande saw more dramatic shifts, starting with 6.8 percent and climbing as high as 7.5 percent before dropping to 5.4 – coinciding with the opening of Tractor Supply Company. The state’s unemployment dropped from 5.9 percent in December to 5.6 percent in January. He said the biggest losses were in trade, transportation and utilities, which dropped more than 18,000 jobs. The only job sector posting gains for the month was in financial activities, which picked up 200. For the year, Walls said, Arizona showed job growth of 3 percent. Nine of 11 jobs sectors showed gains overall. The biggest growth occurred in education and health services with 19,700 jobs. Professional and businesses services gained 17,300 jobs since last January. Despite the predictable January losses, trade, transportation and utilities picked up 13,900 jobs year-to-year. Pinal County’s unemployment rate (orange line) in January matched the state’s (green line). Over the past few months, you may have seen news reports that the American Civil Liberties Union is suing the State of Arizona, including the Pinal County Sheriff’s Office, regarding the use of criminal monies that have been legally seized under the “Racketeering Influenced and Corrupt Organizations” act of 1970 (RICO funds). Now this week, the Goldwater Institute submitted a public records request to our office and sent out their written opinion to local news organizations asking for information explaining how the seized funds are used, the groups these funds are given to, and what the County receives in return for the funds. Much of the criticism over our use of the RICO funds have been leveled at our donations to Pinal County youth programs, organizations that help disabled veterans, shelters that assist domestic violence victims and organizations that help prevent teen suicides. The Goldwater people said in their “news release,” they want to know what we get back from these non-profit organizations. To the people of Pinal County, the return is very clear. These programs make for healthier communities, yes, and safer communities for our residents to live and raise their families. Pinal County is rural and we don’t have the same funding sources as many urban population centers in our state. These programs would not thrive and grow in our communities if they didn’t receive financial assistance like that given by our office. The Goldwater attorneys say they want to ensure “taxpayer money isn’t being misused for personal gain or in violation of the Arizona constitution.” The RICO funding is not taxpayer money, but it is public money that we have legally seized from organized crime syndicates like the Mexican Drug Cartels. Our choice to spend this public money to support our communities’ youth is well within the rules of the Department of Justice and the state laws governing the use of RICO funds. Our use of RICO funds is not in any way supplanting funds for normal government expenses, as has been alleged by the Goldwater attorneys. It is a legal and recognized proper use of these funds. The Department of Justice has stated that up to $25,000 of Federal RICO funds can be used to “support of community-based programs.” The State RICO statutes say, “at least 10 percent of the monies in the fund shall be provided to private, non-profit community based organizations and gang prevention and intervention programs.” We are clearly following the directives of these regulatory agencies. Over the past seven years, the Pinal County Sheriff’s Office has donated approximately $1.5 million of seized criminal money to support youth programs like the Boys & Girls Club, YMCA, High School Graduation Night Lock-in events, youth sports programs, victim assistance programs and drug rehabilitation programs such as the “Home of Hope. The primary job of law enforcement is to protect our citizens. We are doing just that by using money we have seized from drug dealers and other criminals and reinvesting the money into programs to improve the quality of life in Pinal County. As long as the bad guys keep trying to make a living through committing crimes, we will continue to fight them by seizing their illegal gains and use the money to support organizations that help victims and help keep our youth free from drugs, criminal activity and gangs. 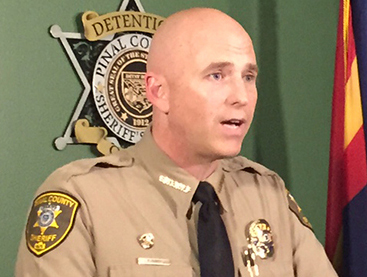 Paul Babeu is the sheriff of Pinal County. A crash Jan. 29 at the Casa Blanca intersection with State Route 347 during morning rush hour backed up traffic into Maricopa along John Wayne Parkway and its arterial streets. The situation is not as uncommon as residents would like. Any improvement to the experience of driving on SR 347 is in demand. One possible solution would have voters raising their own taxes for a Regional Transportation Authority (RTA) that could add lanes to the highway. Because governments cannot base plans on the unknown opinion of the public, the possible RTA and its implications for SR 347 are not part of the Maricopa General Plan. Other transportation proposals are included in that vision, however. Anita Cecini of Tortosa said future plans of an Interstate 11 from Nevada to Nogales were fine for Maricopans wanting to go to Las Vegas but do nothing to relieve the stress of traveling to Chandler. “This does not help,” she said, looking at transportation display boards at one of the city’s four open house events on the General Plan in January. The sessions were meant to gather public feedback as the city prepared to present the draft plan to its various advisory committees. It shows the scope of 2040 Vision and what city zoning and transportation could look like at build-out in 25 years. It also showed the five-year plan that includes an overpass on John Wayne Parkway at the railroad tracks. Resident Dana Jennings said the presentations looked like the city was expecting population growth without taking care of the SR 347 issue. But Pinal County’s proposed RTA includes two projects in the Maricopa area. One of those projects would widen SR 347 to six lanes. “If that information was promoted here, it would alleviate a lot of people’s questions about why are we blowing everything up,” Jennings said of the General Plan’s growth calculations. “There’s going to be a lot of publicity on the RTA because we know there is going to be a vote anytime we try to increase taxes,” Maricopa Transportation Manager David Maestas said. Smith said more information on the RTA would be presented in the spring and summer. He said he expects supervisors to vote on whether to place it on the November ballot during their sessions in June or July. If approved, SR 347 is the first major project on the RTA list, with design starting in 2017 and construction completed by 2020, he said. 2020 is also the year targeted for the construction of the overpass. The RTA would provide $28.8 million to make SR 347 six lanes from Maricopa to I-10. That does not necessarily involve widening the existing road bed. SR 347 runs through land belonging to the Gila River Indian Community, and only a certain width is allocated. But the existing four lanes with median do have enough room for six lanes if designers are creative, Smith said. Anita Cecini’s sister Liz Cecini, a former planner, said information about a possible RTA should be top-most in the city’s discussions with the public about transportation planning. She grilled city staff and committee members on the General Plan process. Maricopa Zoning Administrator Kazi Haque said staff will report public feedback on the General Plan to the city council. How it is processed, he said, will depend on the council’s priorities. 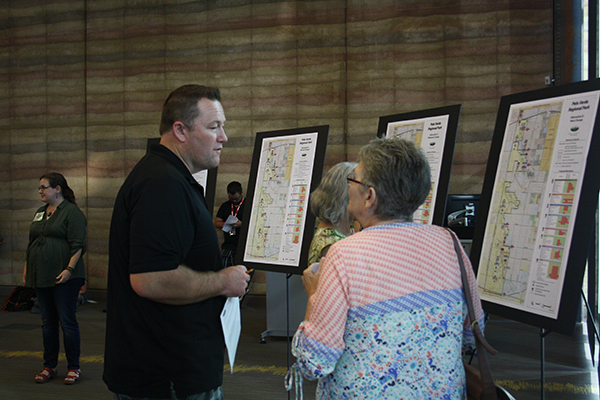 Frequently appearing on priority lists is the creation of a leg of I-11 through Pinal County. That possibility shows up on General Plan maps. It is also the second Maricopa-area project on the potential RTA list. The RTA would allocate $4.8 million by 2024 to acquire right of way for either a leg of I-11 or another high-capacity parkway south of Maricopa. Discussions of an RTA sales tax came about because state and federal money was slow in coming to help Pinal County’s transportation problems. In the past 15 years, Smith said, Pinal County doubled in population and Maricopa grew 4,000 percent, but residents are still using the pre-boom roads. This story appeared in the February issue of InMaricopa News. According to Pinal County, Jersey Mike's was inspected twice in October and scored an E both times. Six out of 10 establishments inspected by the Pinal County Health Department received ratings of Excellent (“E”) in October. Two eateries were found Satisfactory (“S”), correcting violations during inspection. Barro’s Pizza was told to clean the walk-in refrigerator and pizza oven, provide a metal stem food thermometer and cover an employee’s drink in the kitchen. Honeycutt Coffee had to bring a refrigerator down to 41 degrees. Two establishments were marked as Needs Improvement (“N”). Good Donuts was told to provide a food temperature measuring device and provide chlorine test papers to measure the sanitizer. Helen’s Kitchen was told to use food-contact gloves, not latex gloves, replace a light shield and place a required consumer advisory for raw/undercooked food on its menu. The Army Corps of Engineers will hold a public meeting regarding the scope of the upcoming Lower Santa Cruz River Flood Risk Management Feasibility Study. The meeting will take place on Monday, Nov. 9, from 6 to 8 p.m. at the Casa Grande Council Chambers, 510 E. Florence Boulevard. The Army Corps of Engineers will provide information regarding the study and take public comment regarding the scope, potential alternatives and environmental resources of concern. The Corps also encourages anyone from affected federal, state and local resource agencies, Native American groups and concerned groups or individuals to attend. Smith is also on the Executive Committee of the Lower Santa Cruz River Alliance. Pinal County Supervisor Anthony Smith will be meeting with residents of Hidden Valley, Thunderbird Farms and Papago Butte for another Sessions with the Supervisor on Thursday, Nov. 5, from 6 to 8 p.m. The meeting will be held at the Hidden Valley/Thunderbird Farms/Papago Butte Public Works Facility, 43910 W. Meadowview Road in Maricopa. Smith stated this meeting will include Pinal County Animal Care and Control Director Audra Michael from 6 to 7 p.m.. The supervisor will field questions and speak on issues regarding Pinal County from 7 to 8 p.m. Appointments are not required but are encouraged to help reduce time spent waiting. To make an appointment, please email marlene.pearce@pinalcountyaz.gov or call 520-866-3960. The Pinal County Open Space and Trails Advisory Commission announced a contest to design a logo for the County’s Regional Trail network. In 2007, the Pinal County Board of Supervisors approved the Pinal County Open Space and Trails Master Plan (OS&T Plan). The OS&T Plan is the County’s future vision for the regional park, open space and trail resources. The planned regional trails will provide an interconnected multi-use trail network offering a variety of passive and active recreation opportunities, while connecting communities, parks and recreation areas. The planned trail network includes approximately 970 miles of non-motorized, multi use trails and 295 miles of motorized trails. Currently Pinal County manages approximately 55 miles of regional trails and is actively planning to add additional miles in the next 5-10 years. As the regional trail network is planned to expand, the Commission identified the need to create a uniform logo to be used for project signage, publicity and marketing of the regional trail network. * Logos should be fairly simple in design so that they can be easily reproduced, enlarged and reduced as needed. Submission should be emailed to parks@pinalcountyaz.gov no later December 11, 2015. Adobe Illustrator, PDF or similar image formats are preferred, thought all formats including hand-drawn copies will be accepted for consideration. Hard copies can be mailed to Pinal County Open Space and Trails, PO Box 2973 Florence AZ 85132. Submissions will become the property of Pinal County and may be altered, reproduced or otherwise used as needed. The Commission will review all submissions during its January 12, 2016 meeting and may select a winner at that time. The winner will receive a $100 gift certificate, recognition at a future Commission meeting, in County press releases and on the County website. For more information about this contest, please contact Kent Taylor at 520-866-6910 or by email at kent.taylor@pinalcountyaz.gov. The Arizona Department of Corrections needs to fill hundreds of jobs. 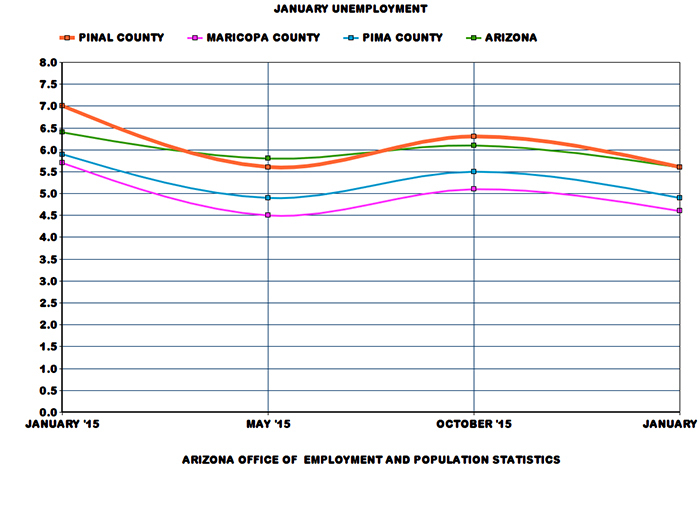 Pinal County’s jobless rate is close to its January numbers after ticking up slightly in July. According to statistics released today by the U.S. Department of Labor, Bureau of Labor Statistics, the national unemployment rate remained the same compared to June while Arizona’s rate grew from 5.9 percent to 6.1 percent. In Pinal County, joblessness was at 6.9 percent in July. That was up from 6.5 percent in June and just under January’s 7 percent. During the month, Arizona had a net loss of 7,200 jobs. The biggest losses were in education, which had a drop of 12,900, comprising most of the 13,500 government job losses. The largest gain in employment was in professional services, which picked up 3,700 jobs. 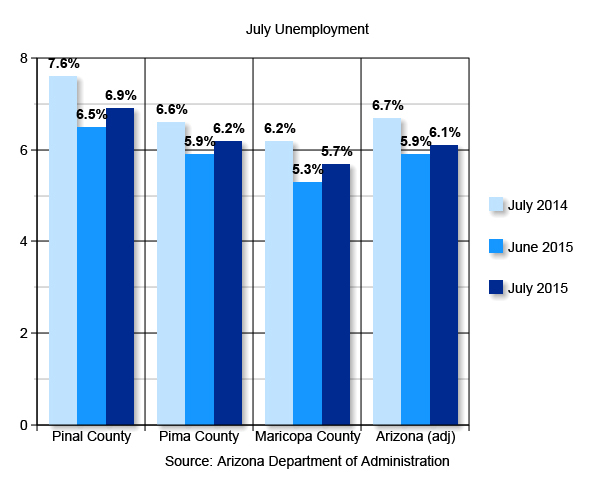 Pinal County’s available labor force shrank by almost 1,000 between the June and July reports, but the number of unemployed grew by about 500 people. The Arizona Department of Corrections announced it has 539 positions open around the state, and nearly 300 in Pinal County. Arizona Workforce Connection will be hosting a “hiring event” for the Arizona Department of Corrections in September. The majority of the DOC jobs are out of Florence, but there are opportunities for job seekers in many parts of Arizona. The event will be hosted at the Arizona Workforce Connection office at 1015 E. Florence Blvd. in Casa Grande. To be considered for a position, job seekers must have a high school diploma or GED, be at least 21 years of age, have no felonies in their background and have a valid driver’s license. Applicants will also be subject to a comprehensive knowledge exam, background check, and pre-employment drug testing. All of which must be passed in order to be considered for a position. However, if an applicant is chosen, they’ll have the opportunity to receive paid training, health and dental insurance, vacation and holiday pay, opportunities for retirement after 25 years and tuition assistance for those looking to go back to school. Other benefits include job stability, opportunities for advancement and higher salaries for more experienced officers. Compared to July 2014, Arizona has had a net gain of 67,600 jobs. There was a year-over-year jump of 6.5 percent in construction jobs in the Phoenix-Mesa-Scottsdale Metropolitan Area, which includes Pinal County. Private-sector jobs have grown 0.1 percent month-to-month and 3.6 percent year-to-year.